Literally the first 45 minutes of me picking from saved links is all it took for this week. tons of updates, more coming… (hope I didn’t break anything ?) MirBSD. The process of upstreaming support to LLVM sanitizers has been finalized. Ingo Schwarze -mandoc Better documentation – on the web and for LibreSSL video is now published. MWL’s 2018 Wrap-Up. More BSD books on the way! Still playing catchup with links. FreeBSD and OpenBSD fundraisers from Michael W. Lucas. One-liners for submitting your dmesg to NYCBUG. There’s other versions in that thread; I linked to the last described. Configuration of OpenSMTPD to relay mails to outbound smtp server. Let’s Try on OpenBSD: CrossCode and Stardew Valley Multiplayer. Port for endless sky submitted to ports@. I’ve linked this game once before; it resembles Escape Velocity, which resembles Taipan, my historic favorite game. pfSense and Google Cloud Identity. iXSystems and the Chinese hardware hack. Process title and missing memory space. Running FreeBSD on OSX using xhyve, a port of bhyve. AF3e ship date and next FreeBSD talk. FreeBSD Desktop – Part 17 – Automount Removable Media. unixpackages.com – a commercial service for packaged software. It’s ports or pkg or pkgsrc, but just for Solaris 2.5+, and it costs money. Technically not a BSD, but the contrast with what we get for free is interesting. Overflow from two weeks running, cause of travel. Next SemiBUG meeting is on the 21st. I’ll post a reminder. installing Postgresql on NetBSD, need help. Why do you use (or contribute to) BSD, rather than Linux? The Battle of the Schedulers: FreeBSD ULE vs. Linux CFS (USENIX). BSD Users Stockholm Meetup #3, September 5th. I’ll post a reminder for that too. Divelog programs: subsurface, divecmd. Things I didn’t know existed, and they are ports. Also now in OpenBSD ports: spacetrader. My favorite game genre. Absolute FreeBSD, 3rd edition, off to the publisher. MidnightBSD: an Introduction, available as a free ebook from Amazon. Some of this is overflow from last week. m:tier subscription service for long-term OpenBSD updates. This is a good idea, connecting a service to the people that want to pay for it – without interfering with the “normal” free usage. FreeBSD has lower latency, and Linux has faster application speeds. The comments at the link source may be better. 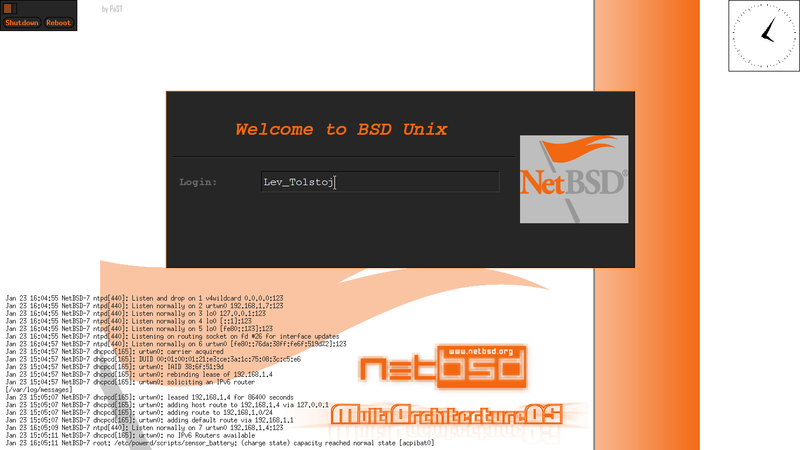 FreeBSD Desktop – Part 11 – Key Components – Blue Light Spectrum Suppress. I didn’t know about Redshift; I like it. Michael W. Lucas has a Patreon account, and a video to go with it. I’ve wondered if I should do something like that for the Digest. The first news item about pfSense is not necessarily new, but new to me. OpenBSD Gaming Resource, PDF document from a previous comment here. What is your experience with Dragonfly as a user desktop? speaking at mug.org 10 April 2018. FreeBSD to be Featured at SCaLE 16x. This Tuesday at SemiBUG: QubeOS vs OpenBSD. Quickly build and test applications across different BSD kernels with tonixxx. *BSD projects and Google Summer of Code. Broadcom 43xx 1.0 driver for MBP mid 2014. Done last minute on Friday, mostly. Guides: Getting Started & Lumina Theme Submissions. pfSense home unit. Follow the thread for some interesting hardware suggestions, including this one. OpenBSD <-> projectors. In case of future need. Michael W. Lucas podcast interview. “Permissive licensing is wrong?” – No it’s not! (2/2). False rumours or not? False. What would be your elevator pitch to a Linux user on why they should try a BSD distribution? Trouble mounting root during install from DVD. Do any of the BSDs support AMD RX 580 GPUs and the new Ryzen 5 CPUs? PCEngine/BSD recommendations. Check the whole thread. Landry Breuil on Mozilla things,Florian Obser on network stack progress, kernel relinking. Hyper V VLAN tag on pfSense? FreeNAS ISCSI Luns & VMware; restricting lun visibility? FreeNAS vs. Server 2016 vs. unRaid? How’s the [Nvidia] driver support compared to Linux? Why are supercomputers all running Linux and not BSD? OS X:Anyone using Xfce or other DE in place of Aqua? Switching from 1Password to Bitwarden. A good variety this week. “SSH Mastery, 2nd Ed” News, Sponsorships, and Cover. First Absolute FreeBSD 3rd Edition preorders available. p2k17 Hackathon reports: 1 2 3 4 5. Nearly Online Zpool Switching Between Two FreeBSD Machines. pfSense – Cisco Aironet AP’s (only 1 works, all identical). This was an easy week for finding links. Next planned NYCBUG meeting: January 3rd. FOSDEM 2018 will have a BSD Devroom; the call for papers is out now – due the 26th. Windows 10, VirtualBox 5.2.0 w/ FreeBSD 12.0-CURRENT Guest. OpenZFS Developer Summit 2017 Report. OpenZFS Developer Summit 2017 Recap. PFSense for PCI compliant network? For once, I was able to work ahead and get this done early! Using the Linux find command with caution. It says “Linux” but most platforms have find(1). What are BSD’s nonfree firmware blobs? Are BSD binaries portable across the different BSD flavors? What’s the current state of optimus support for the BSDs? FreeBSD/EC2: Community vs. Marketplace AMIs. pfSense as Edge firewall/router with DMZ, Sophos SG UTM as internal firewall/router. The BSDCan 2018 site is up. Issues the BSD license does not have.